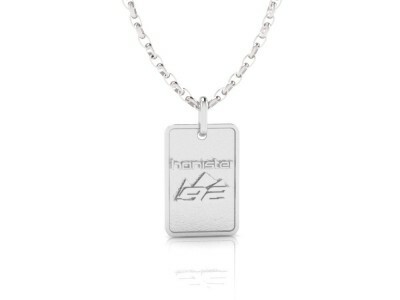 Sterling silver, highly polished Honister 92 ID tag / pendant. Approximately 24mm by 18mm in size, with exquisite oxidised detail to highlight logo and boasting a highly polished finish. The pendant is shown fitted on an 45cm sterling silver curb chain, it can also be fitted on a sterling silver 45cm belcher chain.